Beautiful, quality rug... at a great price, a great value. Safavieh's Antiquity collection is inspired by timeless Traditional designs crafted with the softest designs crafted with the softest designs crafted with the softest wool available. 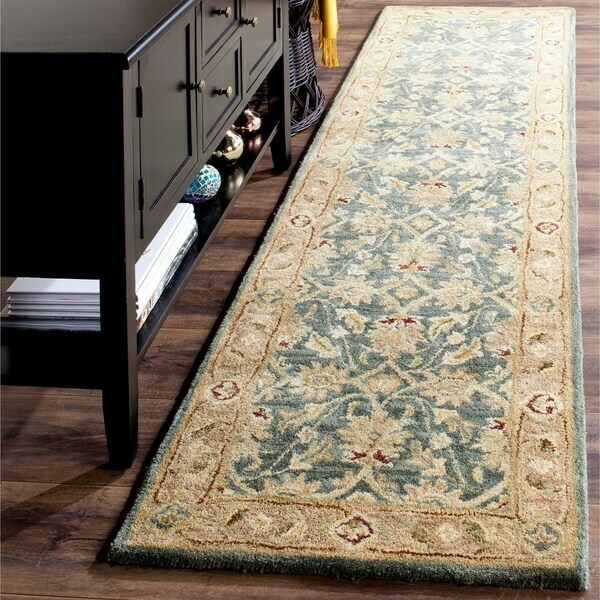 This rug is crafted using a hand-tufted construction with a wool pile and features main accent color of teal blue. Elegant designs and rich colors of this rug is inspired from the 19th century antique Persian rugs. Premium wool is used with a luster wash finish to give it a soft silky finish to ensure this is one of the most luxurious rugs. Dimensions 2 ft. 3 in. x 12 ft. Stunning with my new floors, looks even better than I had hoped. True to colors on the website because I definitely wanted a more "brown than gold" look, and I couldn't have done better if i'd had them handmade as far as the colors go. And so thick and plush. Wool rugs always shed so I expect that, and it is not an issue for me. A couple vacuumings and the rugs are good to go. I have bought numerous Safavieh rugs (and other items), and have loved every single one. They look great, hold up well with a lot of wear, and last forever. Great quality but for some reason, even with a rug pad underneath on my tile, it still slides a bit so I have to keep repositioning it.... maybe my rug pad could be better quality. Rug is great! I was impressed with the thickness and quality of this rug. This rug is absolutely beautiful. The quality is amazing for the price. It could be a buy even at a higher price. It fit perfectly in our hallway and does not need a slip pad. Super nice. Beautiful colors, thick, & very high quality! Nice quality, color true to picture. Nice and thick. Colors, material, and length. And of course the price, but mostly the colors. Love the colors and the length. "what is the backing on this rug?" Safavieh Handmade Antiquity Teal Blue/ Taupe Wool Rug - 9'6" x 13'6"